Our state-of-the-art fitness studio is always open during our operating hours and features professional workout stations, adjustable treadmills, step machines, elliptical machines, calisthenic areas, and an extensive collection of free weights. The dance/exercise room is home to our popular featured fitness classes. From calm and gentle classes like Yoga to energetic and upbeat classes like Cardio Kickboxing, we offer an impressive array of aerobic classes for you to choose from. Our 10,000 square foot gymnasium features tournament-level basketball, volleyball, badminton and pickleball courts that are available for open play at various times throughout the week. Please see the open gym schedule for availability. We have a variety of wonderful personal trainers to help you reach your health and fitness goals, increase you cardiovascular health, and learn about healthy eating choices. 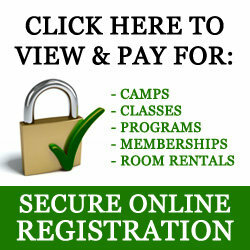 Personal training is not included with your facility usage fees. Let your kids ages 9 months - 10 years old play in a supervised room while you use the facility. You must be present in the Center to use this program. Maximum daily use is 1.5 hours. Prices are subject to change. The following rates include unlimited use of the fitness studio, access to all of the featured fitness classes and entry to the gymnasium for basketball during open gym times. Does not include badminton, volleyball, pickleball or rock wall. * Couple and family members must live at same address. Max 2 people age 23+ in couple and family packages. Effective August 1, 2018, there will be a $25 registration fee for all membership sales. Only the Adult package is available to purchase online. All other memberships can be purchased at the front desk.